Orange Disaster #5, 1963. Acrylic and silkscreen enamel on canvas, 106 x 81 1/2 inches. Solomon R. Guggenheim Museum, Gift, Harry N. Andy Warhol announced his disengagement from the process of aesthetic creation in 1963: “I think somebody should be able to do all my paintings for me,” he told art critic G.R. Swenson. The Abstract Expressionists had seen the artist as a heroic figure, alone capable of imparting his poetic vision of the world through gestural abstraction. Warhol, like other Pop artists, used found printed images from newspapers, publicity stills, and advertisements as his subject matter; he adopted silkscreening, a technique of mass reproduction, as his medium. And unlike the Abstract Expressionists, who searched for a spiritual pinnacle in their art, Warhol aligned himself with the signs of contemporary mass culture. His embrace of subjects traditionally considered debased�from celebrity worship to food labels�has been interpreted as both an exuberant affirmation of American culture and a thoughtless espousal of the “low.” The artist’s perpetual examination of themes of death and disaster suggest yet another dimension to his art. 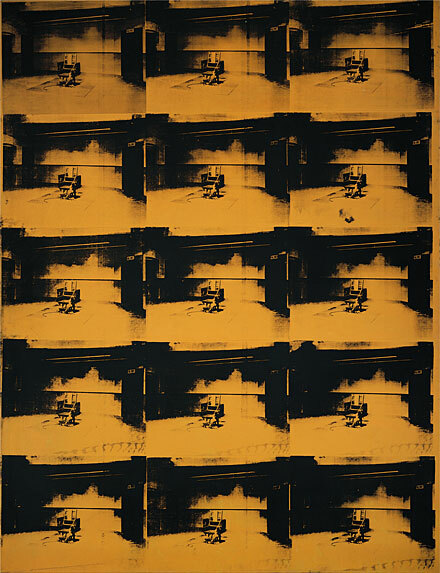 Warhol was preoccupied with news reports of violent death�suicides, car crashes, assassinations, and executions. In the early 1960s he began to make paintings, such as Orange Disaster #5, with the serial application of images revolving around the theme of death. “When you see a gruesome picture over and over again,” he commented, “it doesn’t really have any effect.” Yet Orange Disaster #5, with its electric chair repeated 15 times, belies this statement. Warhol’s painting speaks to the constant reiteration of tragedy in the media, and becomes, perhaps, an attempt to exorcise this image of death through repetition. However, it also emphasizes the pathos of the empty chair waiting for its next victim, the jarring orange only accentuating the horror of the isolated seat in a room with a sign blaring SILENCE. Warhol’s death and disaster pictures underscore the importance of the vanitas theme�that death will take us all�in his oeuvre. Self-Portrait, one of the last self-portraits Warhol painted before his death, may be considered the anxious meditation of an aging artist. (Other works he painted in his final year include a posthumous portrait of Joseph Beuys, who died in 1986, and a rendition of Leonardo da Vinci’s Last Supper.) The monumental scale of Self-Portrait suggests that Warhol’s obsession with celebrity encompassed himself. Yet unlike nearly all of his portraits, which commonly include the sitter’s neck and shoulders, this otherworldly image presents the artist as spectral, his acid green, disembodied head like a skull looming out of the black background.